I love it! They're amazing :D the colour is so bright and pretty! Love it! Bright shoes just have a way of making you feel happy, lol lame as that sounds! 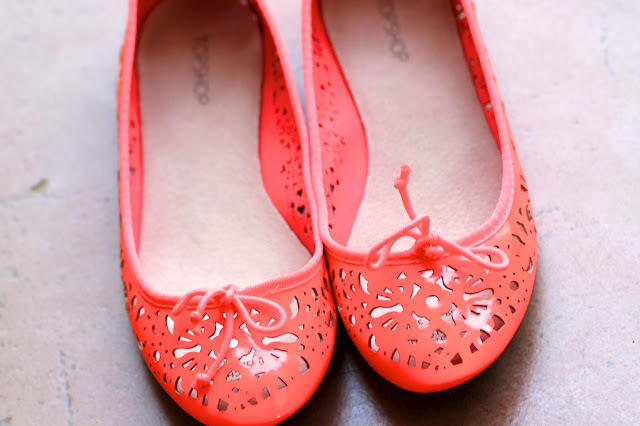 Love those flats!So perfect for spring and summer. I may have to check those out at Topshop soon. A friend of mine has this top and it falls really nicely. Wish Topshop delivered to where I live! I love the shoes, gorgeous way to brighten an outfit! And I have that top in black :) I love it, it's really wearable and stylish, I think I might have to purchase the white one! is it quite transparent or can you wear it on it's own? It can actually be worn on its own. I have the black one on today. I love it. Adore the pretty cutout detail & the colour is fab! Ah I was about to buy that top the other day and went for (another) denim shirt instead! Looks fab on you! I'm quite fussy on flats, I seem to stick to New Look ones, as I find they fit well/they give, as you say..
Love the flats, they really brighten up the outfit :) and I agree with you on Topshop flats, my best friend & I bought the Vectras a year ago and they're still going strong... they've survived 3 holidays and a rainy British summer and still look great! Love the cut out detailing on those shoes, Laura! Funny how cheap flats can sometimes surprise you! Love the punched on those flats! !And the color ir great! I love the cutout of the flats! I was actually planning on buying a similar pair but then I thought it wouldn't be suitable to wear as winter is approaching for me so I wouldn't be able to wear it. Oo I've just ordered these in fuchsia! Love them! Bright shoes always make my day. Will have to hunt these shoes and I love how bright they are! love it! I have an obsession with anything coral/orange, I can't wait to start wearing it in the summer! LOve these, they brighten up an outfit instantly - great buy! "If I can take a decent face picture .." See now, I thought you were being artistic! I know what you mean though .. I usually don't like my photo's either. Every once in a while, a good one comes along and I'll post it. For me, it's rare. I love the pattern! From far away, they look like your run-of-the-mill bright footwear, but up close they have a beautiful cut-out detail. Gorgeous flats! Perfect bright colour for summer! Can't go wrong with a bright shoe for summer, very cute! I love these! They are perfect for the spring months (hopefully) coming soon! I find topshops flats are always too big for me though. Damn having tiny size 3 feet! These are so cute, love the colour and the cut out detail! I love your outfit! it's so chic! I'm normally nervouse about bright 'anything' sometimes get the feeling people will just stare. But I have to admit I might have to get them!! such pretty flats! I love your look! great shoes and color ! Looking lovely dear...I like your high heel shoes !! !